← Coffee and Art…a Delightful Combination! 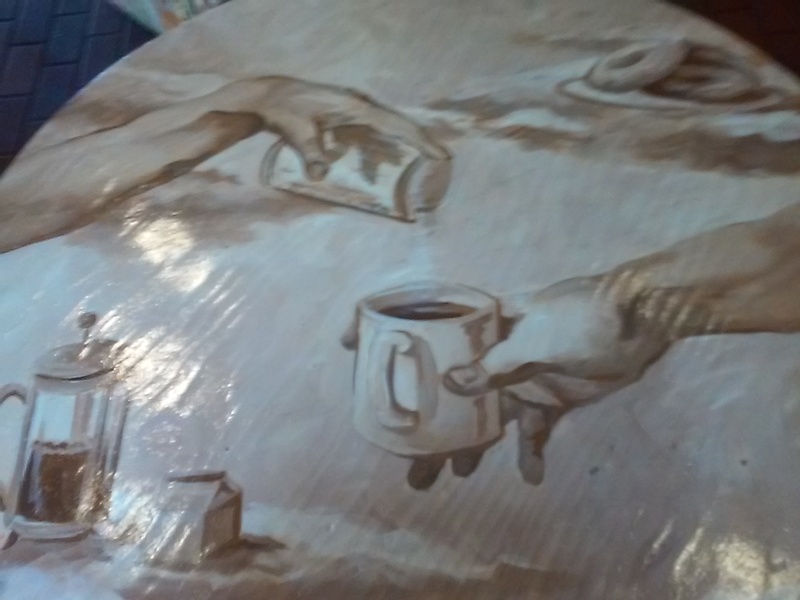 Their table tops are adorned with coffee scenes like these. 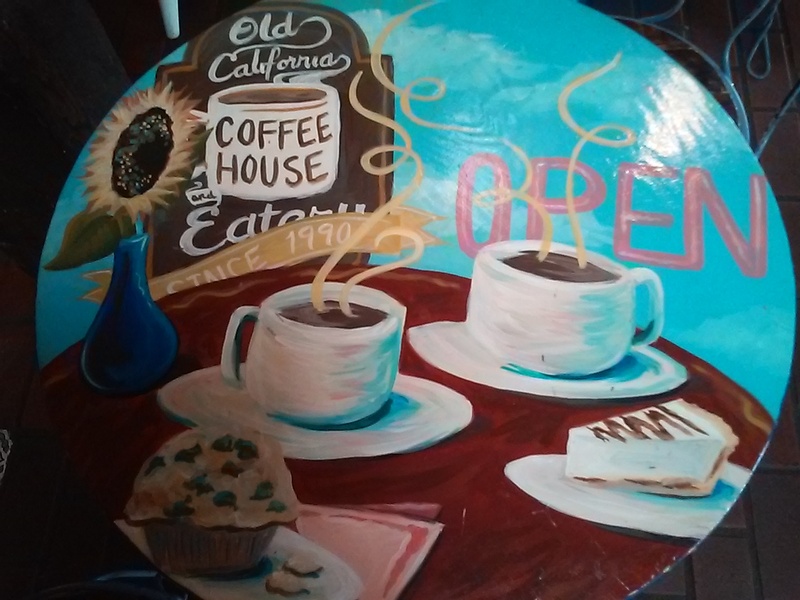 The Old Coffee House and Eatery is celebrating its 25 anniversary and is “San Marcos’ Oldest Coffee Shop,” but neither of us had ever checked out this well-established spot, so we knew it had to be placed high on our list. Since the search for coffee was taking us to San Marcos, we took advantage of meeting a long-time friend who lives nearby. What an adventure! We visited on a summer scorcher of a day with 3-digit heat, so we hit the trail first enjoying the Discovery Lake Trail. The excellent San Marcos trails are well maintained with a trail to fit every person’s interest, time constraint, or ability. The free “San Marcos Parks & Trail Pocket Guide” is a wealth of information on the various trails in the area. It’s tucked away for a future adventure. After our walk, we headed over to the Old Coffee House and Eatery and got iced coffees…refreshing on a hot day! When we asked who roasted their beans, the first answer was “I can’t tell you.” But after a process of elimination, we learned that it’s a local north county roaster. Happy with that “local” answer, we sat outside under the welcoming shade of a large Brazilian pepper tree as we chatted, enjoyed our drinks, and shared a delicious oatmeal and raisin cookie. Yummy. The eclectic interior of the coffee house features hand-painted tabletops, old record albums in frames, a trio of vintage luggage stacked for a coffee table, and a collection of musical instruments. They offer music on Friday and Saturday nights so be sure to visit their website for their live entertainment schedule. The pit fireplace was encircled with chairs and we made a mental note to check it out on a cool winter’s evening. There are many other reasons to return to the area. For example, every Sunday from 11:00am to 3:00pm a farmer’s market is held in the big parking lot for Old California Restaurant Row at 1020 W. San Marcos Blvd. In addition, the first Sunday of every month in May-Nov. from 11:00am to 3:00pm you’ll find an art walk and car show in the same parking lot. Then there are the many restaurants along Restaurant Row. See your restaurant options and other events at http://oldcalrestaurantrow.com/. A quest for coffee can reap big rewards. This one certainly did! This entry was posted in Coffee shops in North County and tagged San Marcos. Bookmark the permalink.